ColourVue Volturi contact lenses will give you an almost natural red-eyes look, so that your Twilight-inspired costume looks completely authentic. Order now at Optyk Rozmus! 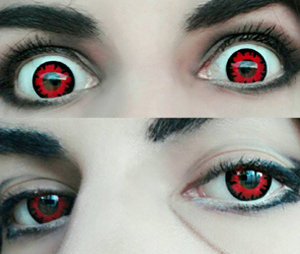 These fantastic red contact lenses inspired by the movie 'Twilight' feature black elements which make them almost 3-dimensional. ColourVue Volturi contacts bring you a new color quality and are a necessary accessory in any vampire costume. Their red and black coloring are blended in such a way, that they seem very natural and will match your vampire/demonic costume and make up perfectly.